MaintenX is sponsoring a Habitat for Humanity home build in Largo, Fla. They began their volunteer labor hours today. MaintenX team members begin work on a Habitat for Humanity home in Largo, Fla.
Service to the community is part of the culture at MaintenX. 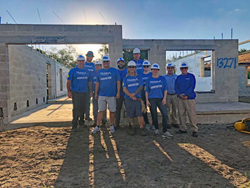 MaintenX International, one of the largest facility maintenance and repair companies in the nation, has started to build the Habitat for Humanity home they sponsor in Largo, Fla. The home build began today and will last about eight weeks. Over that time, more than 130 MaintenX employees will volunteer more than 1,000 hours in constructing the home - five times the amount required from sponsor organizations. MaintenX team members expect to spend a full three weeks onsite, helping build and prepare the home alongside Monique Woodard, the home’s recipient. Additionally, leadership from North Carolina will arrive to help build in late April, while MaintenX’s California team members will be flying in to help with construction on May 21 and 22. MaintenX will provide lunch for employees on all build days and team volunteers will look their best in #MaintenXGives shirts. Woodard is participating through the Habitat for Humanity of Pinellas and West Pasco chapter. She has completed more than 350 of the 450 required sweat equity hours; the remaining hours will be finished with the MaintenX team. Additionally, she only has one more home-ownership class and two more payments to fully cover her down payment costs. MaintenX is proud to serve alongside her. Service to the community is part of the culture at MaintenX. In addition to giving back locally, MaintenX has been providing superior service to customers across the U.S. for more than 40 years. To learn more about MaintenX, visit http://www.maintenx.com.